A hybrid mattress brings together all of the benefits of a coil mattress and a foam mattress while lessening the drawbacks. 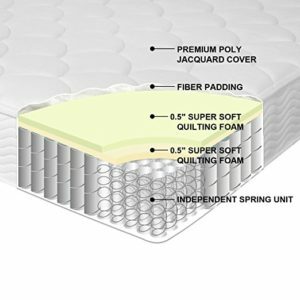 Some sleepers value coil mattresses for their spring and support, while others rest easy on foam mattresses because they provide pressure relief and hugging contour. Both designs have negatives, however. Coil mattresses can offer too much bounce, which can be frustrating for those sharing the bed with a partner who shifts position frequently during the night. Alternately, foam mattresses react sluggishly as the sleeper moves and may make some people sleep too hot. Hybrid mattresses bring the two worlds together, offering foam comfort layers combined with a coil foundation. This design provides support while also hugging pressure points. Some mattress manufacturers even use foam for the supportive core layers. Either way, the result is the same: the consumer benefits from a combination of inner support as well as outer contour and pressure point relief. Sleepers report that they can change position more easily on a hybrid mattress without bouncing their sleep partners around or feeling stuck in the mattress. On this page, we’ll tell you all you need to know about choosing the best hybrid mattress, as well as discuss a few of our top picks. Before hybrid mattresses were developed, consumers were forced to choose either a coil or a foam mattress. Coil mattresses were best for people who needed support and enjoyed being able to shift positions and get in and out of bed easily. Meanwhile, foam mattresses gave sleepers the experience of sinking into the bed, providing comfort and cushion to pressure points. With hybrid mattresses, sleepers can combine support and pressure point relief. 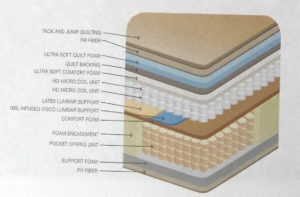 A hybrid mattress features both supportive inner coils (and sometimes foam), as well as comfort layers of foam on top. Coils: From Bonnell coils to offset coils, different coil systems result in varying levels of noise and durability. Pocketed coils are the most popular because they help isolate movement and offer better support and body contouring. Each coil is installed into its own fabric-wrapped pocket. Foam: A hybrid mattress can also have a support core made of polyurethane foam, also known as poly foam. While memory foam softens and conforms under pressure, polyurethane foam compresses and provides support. Its consistent firmness makes poly foam an effective and affordable option for a support core. Polyurethane foam: With different densities available, polyfoam is also effective as a comfort layer. Latex: Durable and supportive, latex can also be quite expensive. Natural fibers: Some hybrid mattresses feature comfort layers made of natural materials such as cotton, bamboo, and even hemp or horsehair. This type of comfort layer can imprint easily and doesn’t work well for sleepers who often switch positions. Buckling column gel: One of the most recent innovations in mattress technology, this design features individual gel-filled chambers. While some buckle when compressed by pressure point areas, the others stay firm to provide support. Microcoils/nanocoils: Smaller versions of the innerspring layer, these are typically encased in a fiber or foam layer. Read all about Mattress Comfort Layers in our guide. Just as with choosing a coil mattress, you should make note of the coil count of any hybrid mattress you’re considering, but the experts at STL Beds remind us that coil count isn’t the end of the story. Because coils are different designs and sizes, the exact same coil count can feel wildly different in two different beds. Instead, focus on overall comfort and the qualities you (and your sleep partner) need in a mattress. Hybrids with less than 1.5 inches of memory foam will be very supportive and somewhat bouncy. Even if they’re called a hybrid, these will behave more like a coil mattress. Mattresses with more than 3 inches of memory foam will behave like a foam mattress, with the foam conforming to the sleeper’s body and providing very little bounce. Meanwhile, 1.5 to 3 inches of memory foam provides a balanced mix of both coil and foam mattress characteristics. What questions should consumers ask when shopping for a hybrid mattress? How much do I want to spend on a mattress? Do I need greater support, greater pressure point relief, or an equal combination of both? Do I tend to get hot as I sleep? Do I (or my partner) get up or switch sleep positions frequently? Is offgassing something that concerns me? As with any mattress, there are pros and cons to choosing a hybrid mattress. Keeping in mind your (and your partner’s) personal sleep preferences, here are the benefits and drawbacks to consider when researching online hybrid mattress ratings. 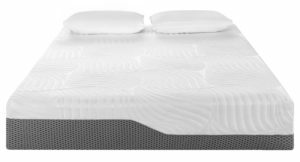 Contour and pressure relief: Memory foam mattresses offer excellent contour and pressure relief. This is ideal for those who find traditional coil mattresses too firm. Support: The hybrid core design works well for sleepers who need more spinal support. Customizable: Hybrid mattresses offer a variety of firmness levels and a customizable sleep experience. With support cores and comfort layers made of a variety of materials, the hybrid mattress experience can range from firm and supportive to softer and more contouring. Motion isolation: Isolation of movement is beneficial for those with partners who frequently move around during the night. Sleeps cool: Hybrid mattresses help eliminate the heat problem that is a common complaint about memory foam mattresses. Durability: Hybrid mattresses that contain polyfoam may not be as long-lasting as other mattress designs. Polyfoam breaks down more quickly than other mattress materials. Offgassing: Although a new hybrid mattress will only release odors temporarily, this can be problematic for those with breathing issues. Cost: Because the best hybrid mattresses are designed with multiple components, this makes them one of the most expensive types of mattress on the market. Heavy: Multiple layers of components make hybrid mattresses heavy and difficult to move. What type of sleeper should consider a hybrid mattress? The support core of coils, foam, or both helps provide immense comfort for those who spend most of the night snoozing on their backs. This ample support helps promote good spinal health. Side sleepers often struggle with traditional coil mattresses because the extra support creates pain where their hips and shoulders contact the mattress throughout the night. The comfort layers of a hybrid mattress help relieve these pressure points, providing just enough give without restricting motion. Because stomach sleeping can cause back and neck pain, it’s essential that those who tend to fall asleep on their tummies use a firm mattress. A hybrid mattress can work for stomach sleepers, providing that it has optimum levels of support. Studies have shown that individuals frequently have their sleep disrupted by their partner’s movements throughout the night. This is the case even when people report that they sleep more soundly with their partner in bed. The foam layers in hybrid mattresses help isolate movement, ensuring that everyone can, in reality, get a restful night’s sleep. Some people can’t pile on enough blankets to keep warm, while others overheat simply through contact with the mattress. For the latter, the heat trapped by a standard memory foam mattress can be problematic. The combination of core support and foam comfort layers in a hybrid mattress mean that even those who sleep hot can stay cooler. With so many hybrid mattress options available on the market, choosing the right one can feel overwhelming. From comfort layers to support cores made of various materials and each mattress providing different features and levels of support, shopping for the best hybrid mattress means sorting through a large amount of information. That’s why we’ve put together our top picks based on compiling a wealth of data and researching the best hybrid mattress reviews. Since 2012, Nest Bedding has been a standout in the bed-in-a-box market because they offer a variety of firmness levels and sell their products both online and in showroom locations in San Francisco, Los Angeles, Chicago, and New York. Although Nest Bedding’s mattresses – including the Alexander Signature Hybrid – are somewhat more expensive than the competition, the brand gets top ratings from the BBB and has built an excellent reputation with its sturdy, eco-friendly mattresses that are made in the U.S. Comfort top: Keeping hot sleepers in mind, Nest features a 2-inch quilted foam comfort layer on its medium firm design and a 1.5-inch layer on its luxury firm mattress. The foam features cooling technology and is topped with a breathable polyester/cotton blend. Support core: The support core of the Alexander Signature Hybrid is a 7-inch layer of 5-zone pocketed coils designed to provide support as well as responsiveness when sleepers switch positions. Firmness options: One of Nest’s 8 mattress models, the Alexander Signature Hybrid features a foam and pocket-coil design available in two firmness levels: medium and luxury firm. 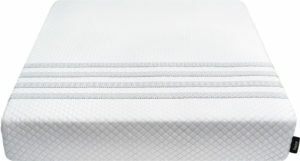 No offgassing odor: Unlike many other foam mattresses, the materials used in this mattress give off no odor immediately after it’s unpackaged. Bounce and edge support: This design stands out among other hybrid mattresses in its performance. 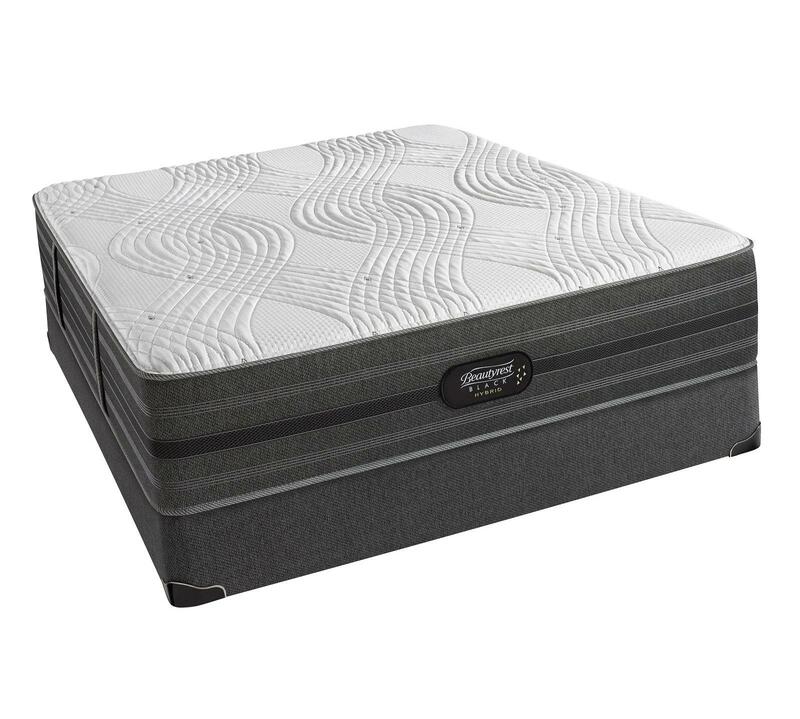 It has an above-average bounce and features improved edge support that extends its network of pocketed coils all the way to the outer edges of the mattress. Durability: The Alexander Signature Hybrid is made of durable foam materials and is expected to last between 12 and 15 years with proper use. In case of problems, Nest offers a 20-year warranty on its products. Check out our full review of the Alexander Signature Hybrid for more information. The DreamCloud is a 15-inch hybrid mattress featuring three innerspring and foam layers. This is a luxury mattress made with high-quality materials at a price point much lower than that found in retail stores. The DreamCloud offers excellent lumbar support and edge support with its high-density foam layers and a 5-zone pocket-coil system. Customers also note the mattress’s 365-day sleep trial and “Everlong” warranty – among the best in the industry – as reasons why the DreamCloud is one of the best hybrid mattresses on the market. Cashmere cover: The cover is hand-anchored to the top layers. Comfort layer: The DreamCloud has two top comfort layers. The first is a gel-infused memory foam layer for cooling and the second a quilted layer for body contouring. Support core: The foundation of the mattress is a layer of high-density poly foam for support and structure. 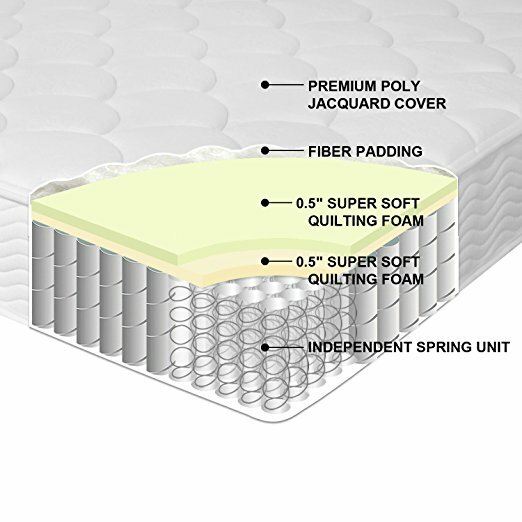 The mid-section includes 2 layers of high-density foam followed by the innerspring layer of zoned and a 5-zone pocket coil system. Consistent support: The DreamCloud’s combination of high-density foam and 5-zone pocketed coils enables sleepers to feel supported anywhere on the mattress, making it ideal for combination sleepers. Quality: The DreamCloud is a luxury mattress made of high-quality components. Sleep trial and warranty: DreamCloud offers an “Everlong” warranty with a 365-night sleep trial. 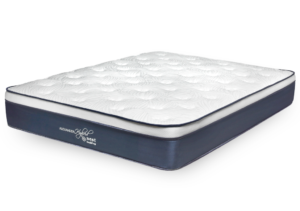 Learn more about the DreamCloud mattress in our full DreamCloud mattress review. The Sapira is produced by Leesa, one of the first companies to compress its mattresses for shipping and sell them directly to customers via the internet. This is the second model of mattress designed by Leesa, a company that has grown popular among consumers for its 100-night trial period and strong social consciousness. The Sapira hybrid mattress combines strong support with excellent pressure relief and little motion transfer. It does this with a combination of pocket springs and layers of foam. Comfort top: Three specially-designed foam layers create comfort and bounce to counteract the support provided by the supportive coil core of the Sapira. They also provide cooling that helps differentiate this model from other memory foam mattresses. Support core: The Sapira is designed with steel pocket springs that provide support, as well as pressure relief. The layout of the springs allow for edge support and very little motion transfer. Support: While online hybrid mattress reviews suggest that it may feel too firm for sleepers weighing 130 pounds or less, the Sapira rates well for heavier sleepers. It is designed to comfortably support up to 350 pounds, but reviewers reported that it works well for sleepers weighing up to 450 pounds. Firmness: The Sapira’s level of support is ideal for back and stomach sleepers, but most find it too firm for side sleepers. Warranty: Leesa offers a 10-year, non-prorated warranty on its Sapira hybrid mattress. For more information, take a look at our full review of the Sapira. The “sleep enthusiasts” at Voila have spent the past 20 years researching and perfecting their mattress design. Their goal is to sell store-quality mattresses online, giving customers a discount by cutting out the middleman. The Voila expands the firmness options offered by other hybrid mattress manufacturers, giving consumers the choice of firm, medium, and plush. This makes it an ideal mattress for a variety of sleepers. Comfort top: Voila uses cooling gel-infused memory foam in its top layers, providing pressure point relief and a comfortable night’s sleep for consumers who sleep hot. They top it off with a breathable mesh fabric that helps circulate airflow. Support layer: The support layer in the Voila is designed with 768 individual pocket coils laid out in five independent zones. Depending on the firmness level, various layers of foam and latex provide support, as well as some bounce. Support: With its extra support, Voila’s 10” firm mattress is an ideal choice for heavier sleepers. No offgassing odors: Because the Voila doesn’t feature as many foam layers as other mattresses, offgassing isn’t very problematic with this model. Sleep trial and warranty: Voila offers a 100-day comfort guarantee and a 10-year warranty on all of its mattresses.